1994 * "In The Light", McIntyre Street Gallery, Regina, Saskatchewan. * Burns Fry Investments, Brockville, Ontario. 1992 * "Panorama", Agnes Etherington Arts Centre, Kingston. Curated by Jan Allen. * "New Paintings", Brock Street Gallery, Kingston. 1991 "Only He Who Sees", Brock Street Gallery. 2012 "Arts and the Arch", Marianne van Silfhout Gallery at St. Lawrence College, Brockville, Ontario. 2012 Joint Exhibit - Jordon Hicks and Maureen Sheridan, Gallery Raymond, Kingston. 2009 "Lit City", Market Gallery, Toronto, Ontario. 2001 "A City Revealed", First Canada Place Gallery, Toronto, Ontario. 1999 "Raison d’Etre", Organization of Kingston Women Artists 10th Anniversary Show, Kingston Public Library. 1997 "Edifice", Curated by Jan Allen, Agnes Etherington Art Centre, Kingston. 1994 *" Winter Group Show", Nancy Poole’s Studio, Toronto. * "33rd Toronto Outdoor Art Exhibition", Nathan Phillips Square. 1993 * "The Canadian Figure", Nancy Poole’s Studio. * "London Life Young Contemporaries 93", London Regional Art Gallery prior to a national tour. Curated by Barry Lord. Exhibit toured until late 1994. * Kingston Women Artists, Kingston Artist Association. 1992 * "The Young And Optimistic", Nancy Poole’s Studio. * "City Seen/City Scenes", Market Gallery, City of Toronto Archives, Curated by Gillian Reddyhoff. 1989 *"28th Toronto Outdoor Art Exhibition"
Private collections in Canada, U.S.A and Europe. *Interview by Maria Sullivan, “Kingston Today”, Kingston Cablenet February 14, 1996. *Lee Parpart, “Hold The Moment”, The Whig Standard, March 1995. Barry Lord, “Twelve Under 30: The New Figuration”, Artfocus, Vol. 3, No. 1, Fall 1994. Jan Allen, “Panorama: Paintings by Maureen Sheridan”, Agnes Etherington Art Centre Exhibitions Catalogue 1992/93. Alec Ross, “Stealing The Show”, The Whig Standard, July 1994. The Recorder & Times, Brockville, June 1994. Cover of “Into The Mainstream,” Annual Report 1993/94 Ongwanada Hospital, Kingston. *Joan Gandier, “Gallery features paintings of Brockville-born artist,” The Recorder & Times, March 1994. Barry Lord, “London Life Young Contemporaries 93 Exhibition Catalogue,” London Regional Art & Historical Museums, London, Ontario, 1993. Kingston Women Artists Datebooks: 1995/ 94/93/92. Paintings,” The Whig Standard, October 1992. Agnes Etherington Arts Centre, Kingston, Sept./Oct. 1992. *Joan Gandier, “Sheridan Shines With New Exhibit,” The Recorder & Times, September 1992. Interview, “Germotte’s Studio,” CBC Affiliate CKWS-TV, Kingston, before Release Into National Syndication, 1991.
scenes of everyday life,” Recorder & Times, May 1991. *Joan Gandier, “Sheridan’s Work Shows New Focus,” Recorder & Times, April 1991. *Jennie Punter, “Ordinary Moments,” The Whig Standard Magazine, June 1990. Cover Of The Whig Standard Magazine, May 1990 & July 1989. Recorder & Times, August 1989. *Joan Gandier, “Art Exhibit Displays Superior Quality,” Recorder & Times, April 1989. *Doug Ferris, “A Celebration Of Suburban Life In Art,” The Queen’s Journal, March 1988. 2012 Best two-dimensional work, Arts and the Arch, Frontenac Biosphere 10th anniversary Exhibition, Marianne van Silfhout Gallery at St. Lawrence College. President of the Organization of Kingston Women Artists, 1995-1997. Ongoing member. 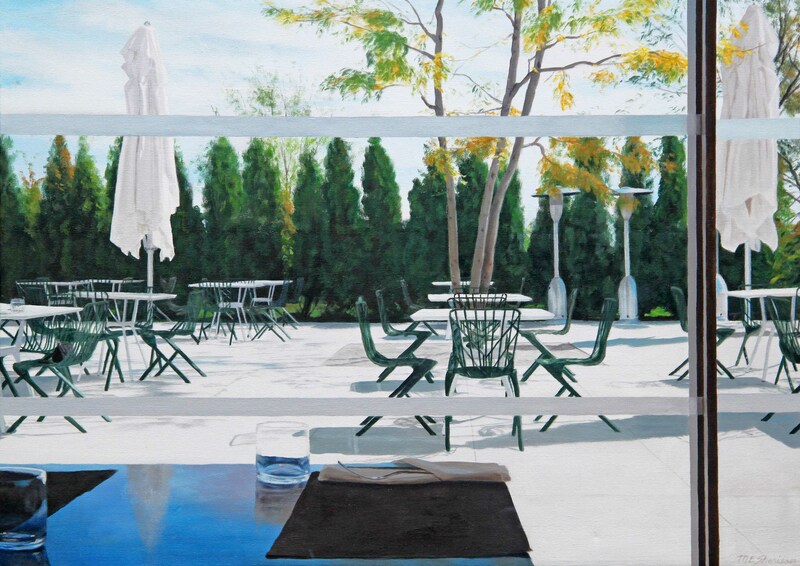 Honourable Mention, Best Painting, 33rd Toronto Outdoor Art Exhibition, 1994. Best Painting Award, David L. Stevenson & Son Artist’s Colour Co. Ltd., 28th Toronto Outdoor Art Exhibition, 1989. Honourable Mention: Lt. Governor of Ontario Award of Excellence, 28th Toronto Outdoor Art Exhibition, 1989. Second Prize. Painting. Artsfest. Queen’s University, Kingston, Ontario, 1989. First Prize. Painting. Artsfest. Queen’s University, 1988. Honourable Mention: Lt. Governor Of Ontario Award Of Excellence, 27th Toronto Outdoor Art Exhibition, 1988. B.F.A. (First Class Honours) Queen’s University, Kingston, Ontario, 1989. B.A.H. Art History, Queen’s University, 1986. Copyright© 2008 - Maureen Sheridan - All rights reserved.